UCSD environmental engineering freshman Ntiya Timalsina in the field. While she was still in high school, Nitya Timalsina began working on developing cheap yet powerful water filtration systems in Third World countries like India and Nepal, her birthplace. Timalsina, now a freshman environmental engineering student at UC San Diego, hopes to implement these systems – as well as small hydroelectric power sources – in Southeast Asia and expand to other countries in need. She has worked extensively with Rotary International, Engineers Without Borders, and San Diego water authorities on the research aspect of this project, and with the help of local and international organizations and quite a bit of fundraising, she hopes to create a project proposal to obtain matching grants that will allow her to have a few systems established by the end of 2011. Timalsina is part of a new crop of eco-conscious engineers who are using their brainpower to come up with creative sustainable solutions. She is one of 157 students enrolled in UC San Diego’s environmental engineering program. Timalsina believes that her environmental engineering classes will give her more insight about conducting the water filtration project, as well as other future environmental projects. UC San Diego’s Environmental Engineering program, created in 2004 as part of the Jacobs School of Engineering’s mechanical and aerospace engineering department, teaches students the skills to develop new clean technologies for the future. The interdisciplinary nature of environmental engineering links the program with other departments at the university, such as the Scripps Institution of Oceanography, the department of chemistry, and the majors in Urban Studies and Planning and Environmental Systems. 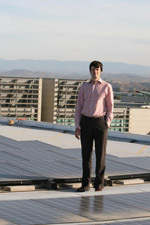 UCSD environmental engineering professor Jan Kleissl is leading the next generation of green tech workers. The growth of UC San Diego’s environmental engineering program, up from 92 students in 2009 (a 70 percent increase), can be partly attributed to its faculty, which includes world leaders in solar power research, biofuels and climate change. One of them is Jan Kleissl, an environmental renegade of sorts who gives his students in-the-field projects using novel technologies for renewable energy solutions. Kleissl’s much-touted projects have included Decision Making using Real-time Observations for Environmental Sustainability (DEMROES), a network of weather-monitoring stations which is being used to help reduce energy consumption in UCSD campus buildings; a sky imaging tool and instruments to create hourly solar production forecasts; and sensor technologies to devise new strategies for irrigating farmland more efficiently. “The whole university has such a progressive image and we are doing so much on sustainability on campus. This helps young people get the idea that there’s something interesting going on here,” Kleissl said. He said environmental engineering is becoming more attractive to students and important to industry and national leaders as the United States works on becoming more energy independent. One of the biggest areas of the renewable energy field where environmental engineers are needed, Kleissl said, is in the solar power industry. 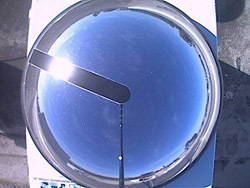 UCSD environmental engineers are using novel technologies such as the total sky imager above, to track the efficiency of solar power, as well as other renewable energy projects on and off campus. This stimulating strive for energy efficiency motivates Timalsina, who is currently working on a solar irradiation resource project for Kleissl. The project involves using various technologies to collect data to understand more about irradiation levels in different weather conditions. Through spectral irradiance sensors, optical depth and variable atmospheric constituents such as forest fire smoke, air pollution, and even water vapor in the entire atmosphere can be quantified. These constituents can greatly impact power production at concentrated solar thermal power plants such as the recently approved plants in California’s Imperial Valley. This data could prove useful in locating and operating solar power plants more effectively and contribute to the world's growing need for safe and reliable alternative technology, she said. There are several job options for environmental engineering graduates to earn a living while making a difference, including in the renewable energy industries, as well as employment as compliance officers for companies and government agencies. UCSD environmental engineering freshman Ntiya Timalsina. Chantelle Domingue, who graduated in 2009 from UC San Diego with an environmental engineering degree, currently has an internship with a local company that specializes in battery research. Domingue, who will earn her master’s degree in mechanical and aerospace engineering from UC San Diego in spring 2011, plans to start looking for a job early next year. While she is focusing on fluid mechanics, Domingue said having an environmental engineering degree and experience will help her overall career. For Jan Kleissl, helping to train the next generation of environmental engineers makes his job even more worth it. “It’s a pleasure to work with students who are excited and have a true passion about their major,” he said. Chantelle Domingue, who graduated in 2009 from UC San Diego with an environmental engineering degree, currently has an internship with a local company that specializes in battery research. Domingue, who will earn her master’s degree in mechanical engineering from UC San Diego in spring 2011, plans to start looking for a job early next year.